The results of a TDB search are either written in the translation box of a TU (if you work in document mode), or they are presented in a special dialog box. When this option is active, the machine translation results are shown in the Scout dialog (for more information, see the Scout). 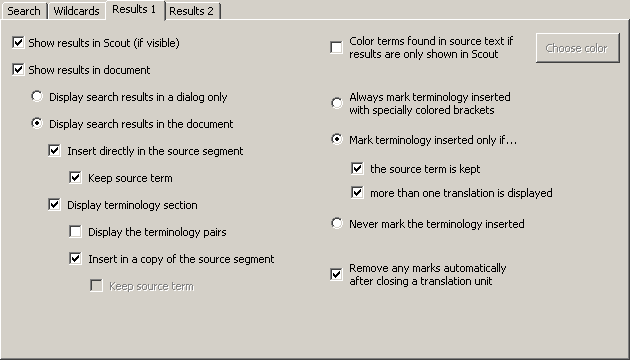 When this option is active, the machine translation results are shown in the document, according to the following settings. If this option is active, the TDB search results are not written in the translation box in any way, but only presented in a special dialog box. If this checkbox is checked, the TDB search results are inserted in the source segment. If this checkbox is checked, the source term for the inserted translation is kept. If it is not checked, the terminology found is just replaced with the translation. If this checkbox is checked, the TDB search results are inserted in the translation box, according to the following settings. If this checkbox is checked, the search results are displayed in a table right below the source segment. If this checkbox is checked, the source segment is copied, and the search results are inserted. If this checkbox is checked, the source term for the inserted translation is kept. If it is not checked, the terminology found is just replaced by the translation. Note: Both the Insert directly in the source segment and Display terminology section options cannot be de-activated, since this does not make sense. If you want to de-activate one option while the other is not checked, you first have to check the other one before you can uncheck the first one. The same is true for the Display the terminology pairs and Insert in a copy of the source segment options. If this option is checked, any inserted terminology is marked with colored brackets (e.g. "[term]"). The color is the same as the one chosen for identical segments (defined in the General Options dialog box; see Colors and Frames). When this check box is checked, the terminology is marked if the source term is kept (see above). When this check box is checked, the terminology is marked if more than one translation was found for the source term. If this option is checked, any inserted terminology is never marked. If this checkbox is checked, any marks are removed when a translation unit is closed. 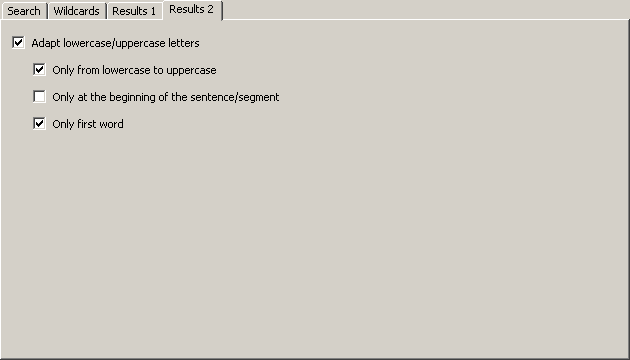 When this option is checked, any inserted terminology is automatically converted to lowercase/uppercase, if appropriate. When this checkbox is checked, the terminology found is only converted from lowercase to uppercase, but not from uppercase to lowercase. For the most language combinations this checkbox should be checked. When this checkbox is checked, the lowercase/uppercase conversion is only made for the first word of a sentence/segment. When this checkbox is checked, the lowercase/uppercase conversion is only made for the first word of a term/phrase found, but not for all words. That is, not all words in the translation are converted, but only the first one. If the checkbox is not checked, all words of the translation are converted only if all words of both the source text and the translation are lowercase or uppercase. If there is a mix of uppercase and lowercase words, only the first word is converted.